Since you’re on this page, you’re interested in experiencing Jiu-Jitsu for the first time. We’ve been there, and understand how intimidating it can be! We make sure that students new to Jiu-Jitsu are guided along slowly, safely and and thoroughly through the basics, to reduce the risk of injury and increase the enjoyment of Jiu-Jitsu. Everyone at our gym subscribes to the 0% ego, 100% progression mentality that keeps practice fun. With Brazilian Jiu-Jitsu, leverage and skill are utilized to best size and strength. No matter your age, size, gender or strength, through Jiu-Jitsu you will learn to use your advantages to win on and off the mat. Jiu-Jitsu practice will increase your functional strength and flexibility. Regular exercise is easy when it is fun and engaging, and reduces stress while improving everyday life. You'll never feel like an outsider at a Fusion Academy Brazilian Jiu-Jitsu class. Join us for free while you’re in town! Contact us with the dates of your trip and we’ll set everything up. At a young age, Helio Gracie realized that modified Japanese Jiu-Jitsu techniques would enable a smaller person to defend themselves against stronger opponents. Through the years, he proved his system’s effectiveness by not just defending against, but defeating larger competitors. Helio’s system is known as Brazilian Jiu-Jitsu, and was passed from Master Helio to Pedro Sauer, and from Pedro to Eddie Edmunds. Multiple Black Belt instructors bring decades of expertise to your classes. Our head instructors are out training with every student, from white belts to brown belts, every day. You’ll feel at home and welcome from day 1. Let us know what your goals are: fitness, self defense, competition, or meeting new people. We’re here to help you succeed. No prior experience in martial arts necessary! We love welcoming new people to the Jiu-Jitsu world. I had a wonderful time rolling at Fusion. Chris, the instructor, clearly and patiently taught techniques that were useful for me as a white belt. Everybody that I rolled with was friendly and supportive…This kind of hospitality is keeps me motivated about Jiu-Jitsu. Eddie is extremely knowledgeable and ensures a healthy and safe learning environment. Fusion academy provided a great introduction to the sport! Loved it! Stopped in during my travels through Salt Lake City and was welcomed with open arms… Everyone was willing to help and seemed focused on better their skill set. They even had a new guy come in that particular day and they set a instructor to the side just to focus on him! Amazing school!! They all have so much skill and experience, and there is always a class I believe there is 19 a week. I can go to any class I would like and they are always willing to roll and work one on one after class, it’s great exercise and I learn something new everyday. Eddie and the instructors at Fusion are awesome, and so are the students. Even on the first day, I never felt like an outsider. If you’re looking to start training Jiu Jitsu, it would be a mistake not to drop in and try a class at Fusion Academy. 6:00 AM – Instructor Chris Earl warms up with functional Brazilian Jiu-Jitsu movements. The class then moves on to training Brazilian Jiu-Jitsu techniques. When the class ends with free rolling, new students are invited to continue drilling, or work specific positions. Morning classes have a good amount of students, and Chris always keeps an eye on drilling partners, giving advice to make sure you’re training each technique properly. 12:00 PM – Instructor Steven King starts class off with a Crossfit inspired ‘warm-up’ designed to push your limits. The class then drills Brazilian Jiu-Jitsu techniques and ends with free rolling. At this time new students are invited to continue drilling, or work specific positions. Mid-day classes have fewer students and plenty of one-on-one time with the instructor. 7:00 AM – Professor Chris Wells starts class with a warm-up of functional Jiu-Jitsu movements. The class then drills Brazilian Jiu-Jitsu techniques and ends with free rolling. At this time new students are invited to continue drilling, or work specific positions. Morning classes have plenty of students. Chris makes sure get you the specific pointers you need to improve your technique. 6:00 PM – Professor Eddie Edmunds uses functional Brazilian Jiu-Jitsu movements as a warm-up. Afterwards, the class trains a self-defense technique, then moves on to positional drills. What position will depend on the phase of the curriculum that week: back, side, mount, guard, etc. When the class ends with free rolling, new students are invited to continue drilling, or work specific positions. Evening classes have more students, and more opportunities to see how each technique works for and against different body types, and Eddie is excellent at making sure you’re focusing on the right details for your skill level. 12:00 PM – Professor Eddie Edmunds uses functional Brazilian Jiu-Jitsu movements as a warm-up. Afterwards, the class trains a self-defense technique, then moves on to positional drills. What position will depend on the phase of the curriculum that week: back, side, mount, guard, etc. When the class ends with free rolling, new students are invited to continue drilling, or work specific positions. Mid-day classes have fewer students and plenty of one-on-one time with the instructor. Eddie excels at making sure you’re focusing on the right details for your skill level. 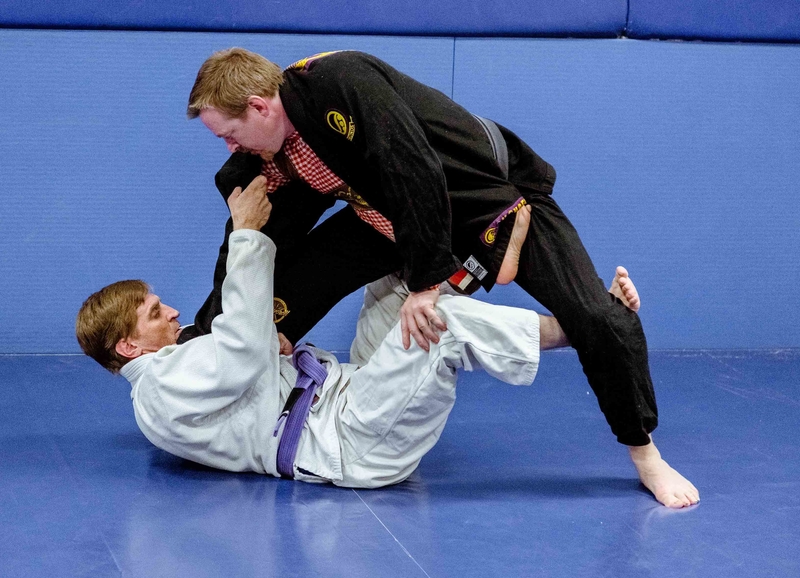 7:00 PM – Professor Steffen Soller starts class with a warm-up focusing on functional Jiu-Jitsu movements. The class then drills Brazilian Jiu-Jitsu techniques and ends the class with free rolling. At this time new students are invited to continue drilling, or work specific positions. Evening classes have a good number of students. Steffen is great about working with drilling partners to make sure that the little details are right from the first day of practicing a technique. 7:00 AM – Professor Chris Wells starts class with a warm-up of functional Jiu-jitsu movements. The class then drills Brazilian Jiu-Jitsu techniques and ends with free rolling. At this time new students are invited to continue drilling, or work specific positions. Morning classes have plenty of students, and more opportunities to see how each technique works for and against different body types. Chris will make sure that you get specific pointers to improve the techniques that day. 12:00 PM – Instructor Kevin Hausskuper starts class off with a warm up focusing on stretching the muscles taxed by Brazilian Jiu-Jitsu. The class then drills techniques and ends with free rolling. At this time new students are invited to continue drilling, or work specific positions. Mid-day classes have fewer students and plenty of one-on-one time with the instructor. 11:30 AM Open Mat – Students of both Brazilian Jiu-Jitsu and NoGi Jiu-Jitsu are able to get time on the mats in this block.